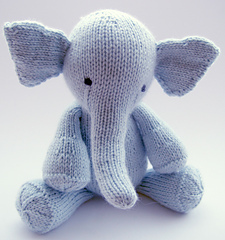 Elijah is approximately 26 cm / 10” tall. 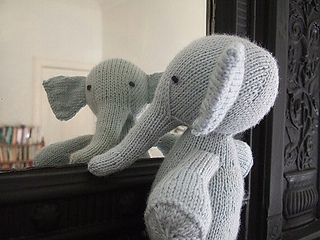 An adorable elephant toy knit without seams on double pointed needles. 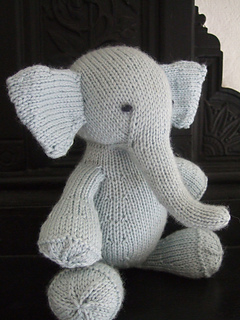 Elijah was designed to be round and cuddly but still easy for little hands to grasp. 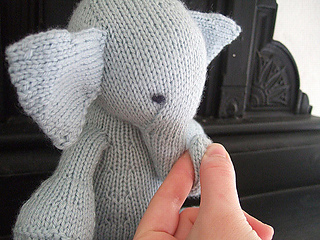 He knits up quickly and since gauge isn’t too important is a great way to use up small amounts of yarn. 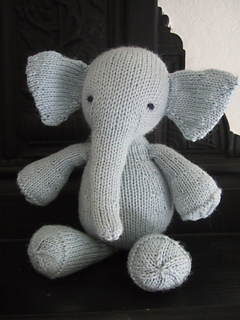 Elijah would make a wonderful gift for any kid – or adult. Small amount of darker yarn for embroidering eyes. For a toy that won’t be played with by babies or young children you could use toy safety eyes. 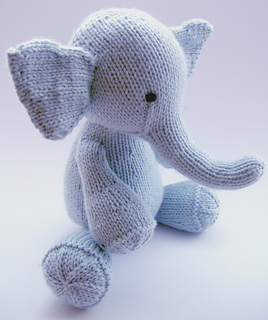 Because size is not crucial to this project the gauge does not need to be matched exactly and the overall size can be changed by changing the yarn weight and needle size. The most important thing is to work Elijah at a relatively tight gauge to create a firm fabric without holes that the stuffing can poke through. If you are using a different yarn weight you should use needles to achieve a tighter than recommended gauge.